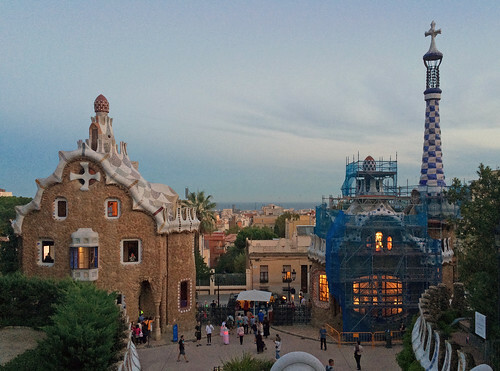 Barcelona is synonymous with Gaudi. Antoni Gaudi is everywhere, and I don’t just mean at the souvenir shops. 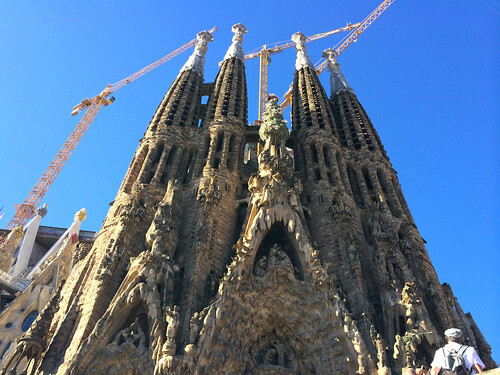 Many of Gaudi’s architectural works have been granted UNESCO World Heritage status, not least of which is the Sagrada Familia. 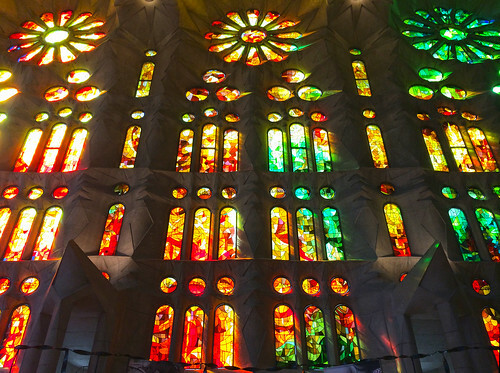 I don’t think I was prepared for how overwhelmingly stunning the Sagrada Familia would be. Honestly, I still can’t process it. I don’t care what religion or creed you belong to. Now this, I thought to myself, is a house of God. 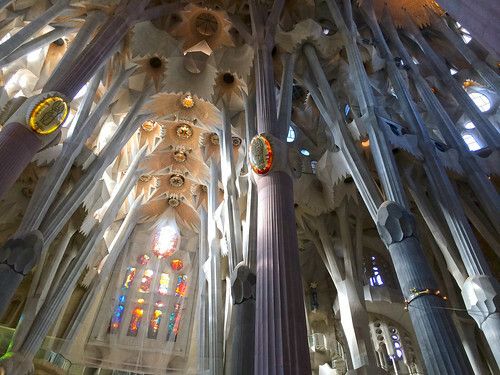 The columns are designed to mirror trees and branches; Gaudi was famous for an organic style inspired by natural forms. 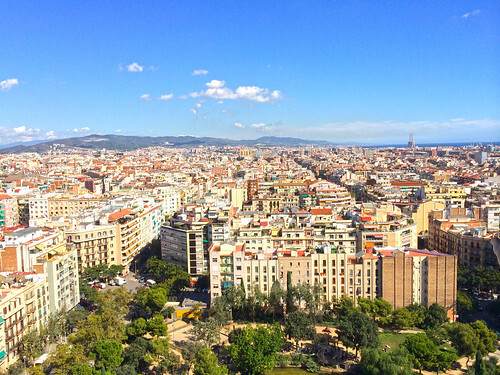 Even the rooftop affords a panoramic view of Barcelona, from the sea to its famous hills. What audacity he must have had to have designed his interpretation of a basilica — and I mean that in the best way possible. Afterwards, we took a taxi to the Barceloneta district for lunch at Xiringuito Escriba, a breezy Mediterranean beachfront seafood restaurant. 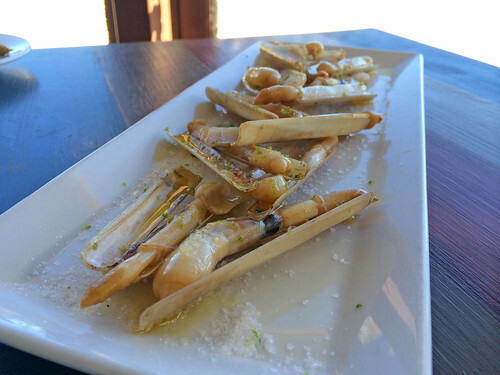 I had to get the grilled Galician razor clams. The only thing better than grilled seafood is grilled seafood doused with excellent olive oil — and Spain has no shortage of that. 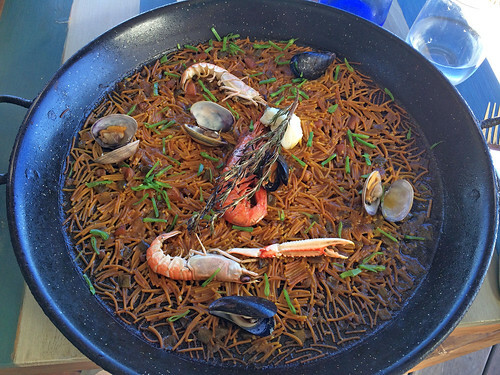 I also had the fideua, a Catalan specialty. Similar to paella, these toasty noodles were cooked with seafood and seasoned with a bit of lemon. The seafood was top notch but the dish was too salty. Too bad. We weren’t done with Gaudi just yet, though. After lunch we took the train to Park Guell, an expansive hilltop park overlooking the city and yet another of Gaudi’s gifts to Barcelonians. 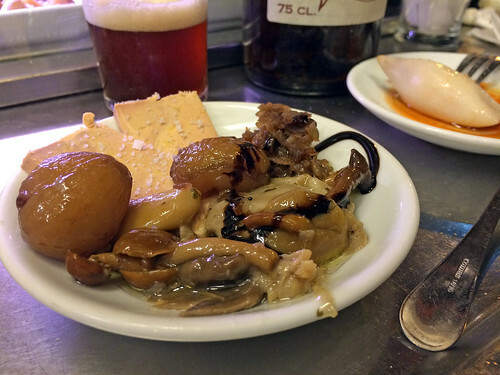 It was time for dinner, so we hightailed it to the Poble-sec neighborhood for what was to be my favorite meal in Spain: tapas at Quimet y Quimet. This postage stamp sized bar is standing room only, but it’s more than worth it to squeeze in for a meal. 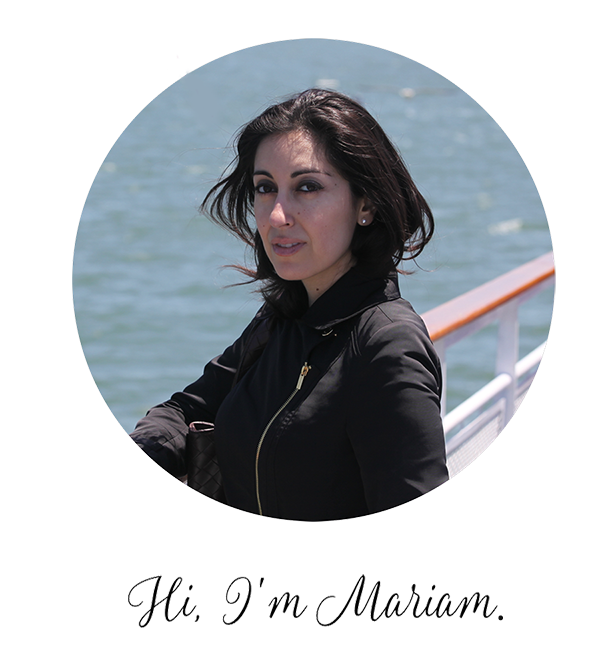 Service is straightforward and no nonsense. I don’t speak Catalan, but I can get by just fine in Spanish, so I did all right. If you’re not sure what to order, point at what looks good and dig in. 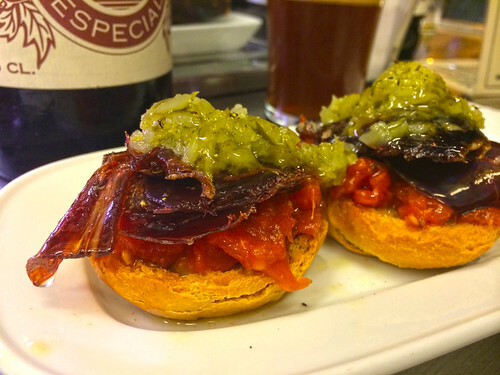 To begin, we had the cured beef cecina and sweet tomato montadito. I’m pretty sure my eyes rolled back in pleasure at this one. 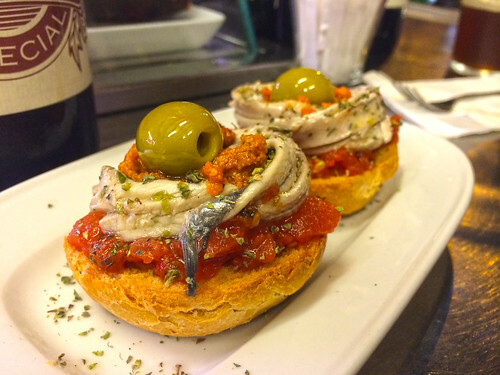 Next up was the anchovy and baked red pepper montadito. This was as wonderfully delicious as it looks. 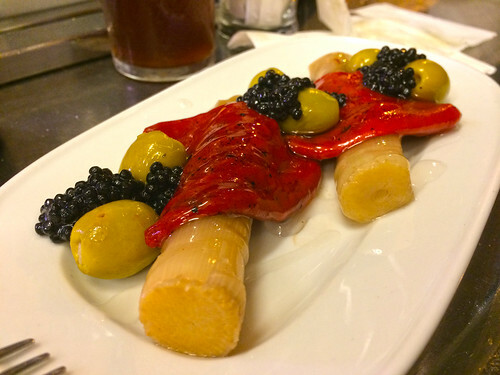 Third, we tasted the asparagus with olive, pepper, and caviar garnish. I am in love with Spain’s super soft canned asparagus spears. Also this dish comprised roughly fifty percent of my vegetable intake during this trip. 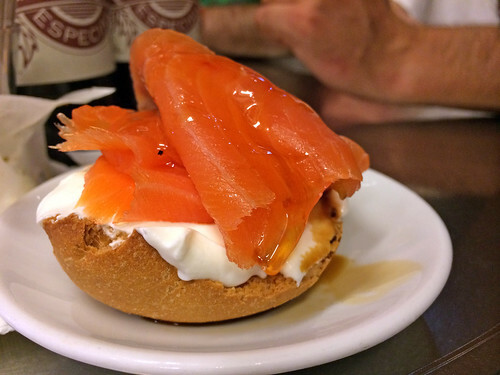 Next we had Quimet y Quimet’s most famous dish: the salmon, yogurt, and truffled honey montadito. I enjoyed this but strangely enough preferred the others. I can probably assemble this at home. We then had the scallops with caviar montadito. Along with the cecina and anchovy montaditos, this was my favorite. 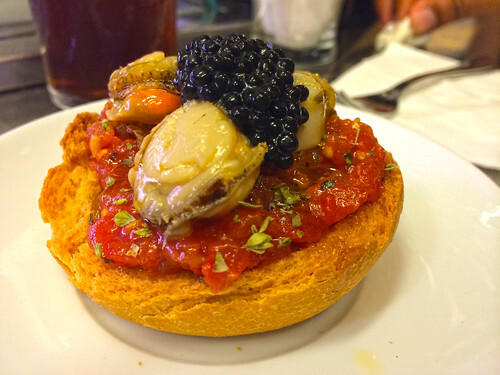 Catalan tinned scallops are out of this world. Are you still with me? Good, because we’re wrapping up. The stuffed baby squid was fine but my least favorite dish of the meal. More flavor, please. Our last dish of the evening was the foie gras and mushrooms. Nishan loved the foie gras, I loved the mushrooms. Everyone was happy. Everyone won. Quimet y Quimet, I salute you.